Just a bit of geography for readers who might not be familiar with the cruising grounds referenced in these posts. Above is a general overview of the Great Lakes. Well, the ones closest to the areas we’ve been traveling these past few months. Georgian Bay, highlighted in green, connects to Lake Huron to the west, and is the southern edge of the Canadian Shield. It’s similar to the well-known Thousand Islands area of the St. Lawrence to the east, and is known as The Thirty-Thousand Islands because of all the islands, about 30,000. Who knew?? 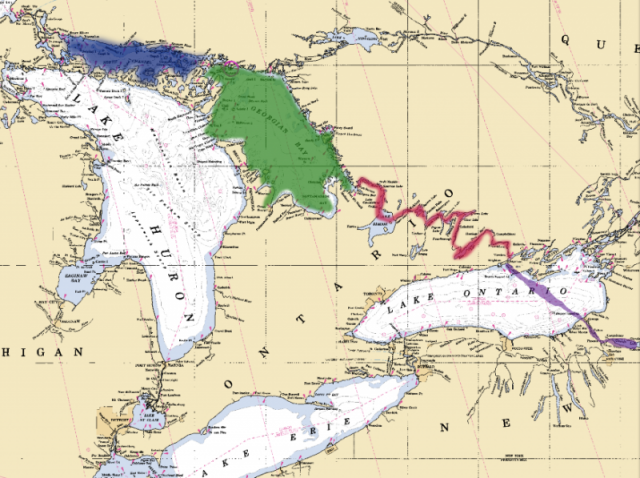 To the north and west, lies the body of water highlighted in blue known as North Channel that also connects to Lake Huron. Also lying along the southern part of the Candian Shield, it’s more remote and less developed. Both areas are wonderful cruising grounds with virtually unlimited anchorages. North Channel and Georgian Bay connect through a channel at Little Current. The maroon highlight is the Trent-Severn Waterway, and the violet depicts the route from the terminus of the Erie/Oswego Canal at Oswego to Trenton, Ontario, where the Trent-Severn Waterway begins. Our route will be up-and-back, retracing our steps. We discussed a loop that would take us from North Channel south across Lake Huron, down the St. Clair River and across Lake St. Clair, past Detroit to Lake Erie, then east across Lake Erie to the Welland Canal then north to Lake Ontario and back to Oswego. Alternatively, the Western Erie Canal from Buffalo east to the Oswego Canal junction would be an option, but very low bridge clearances and high water levels would require more than just laying our mast back to gain adequate clearance. Either route adds over 200 miles more than the retrace return trip. Given our time frame, we’re choosing a slower pace. We prefer cruising with a very loose itinerary. Individual posts are geo-coded so they correspond in date to the location map. The location map categorizes the posts based primarily on the general area of the cruise, showing the route followed on that cruise. Clicking on a location pin on the map will open the post that corresponds to that location. The icon on the top of the post or the sidebar will take you to the map or the link above.